The BICEP2 telescope at the South Pole uses novel technology developed at NASA's Jet Propulsion Laboratory in Pasadena, Calif. The focal plane shown here is an array of devices that use superconductivity to gather, filter, detect, and amplify polarized light from the cosmic microwave background -- relic radiation left over from the Big Bang that created our universe. Image released March 17, 2014. Discovering the first direct evidence of the universe's incredible post-Big Bang expansion wasn't easy, requiring the development of new technologies and a long working stint at the bottom of the world. Astronomers announced Monday (March 17) that they had detected the signature of primordial gravitational waves — the long-sought "smoking gun" for the theory of inflation — in the cosmic microwave background (CMB), the ancient light left over from the Big Bang that created our universe 13.8 billion years ago. The telescope's location made it a great choice for such an ambitious study, team members said. ‪"The South Pole is the closest you can get to space and still be on the ground," project leader John Kovac, of the Harvard-Smithsonian Center for Astrophysics, said in a statement. "It's one of the driest and clearest locations on Earth, perfect for observing the faint microwaves from the Big Bang." The team built an array of 512 superconducting detectors, which allow electrical current to flow with no resistance at very low temperatures. The new BICEP2 system operated at just 0.45 degrees Fahrenheit (0.25 degrees Celsius) above the coldest temperature possible, which is known as absolute zero. 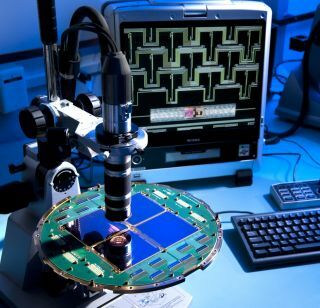 This image shows one of the NASA detectors from the BICEP2 project, developed in collaboration with the National Science Foundation. "This extremely challenging measurement required an entirely new architecture," team member Jamie Bock, of NASA's Jet Propulsion Laboratory and Caltech in Pasadena, said in a statement. "Our approach is like taking a camera and building it on a printed circuit board." Inflation theory posits that the universe grew incredibly rapidly in the first few tiny fractions of a second after the Big Bang, transitioning from mere quantum fluctuations to something of macroscopic size. This dramatic expansion produced gravitational waves, the idea goes, which in turn generated a type of CMB polarization known as "B-modes." The super-sensitive detectors on BICEP2 did indeed pick up the characteristic B-mode swirls, sending a buzz through the astrophysics community that leaked out to the general public today. If the results are confirmed by other research groups, experts say, the BICEP2 team has etched its name in the history books and established itself as a front-runner for a Nobel Prize sometime down the road. There is still more work to be done, of course. The basic theory of inflation seems to be on solid footing, but further analysis of the CMB will reveal more details about how it all went down. The BICEP2 team is helping lead that charge, already scanning the heavens with a new array that features 2,560 superconducting detectors.